When I mention I’m bad at these types of games, I’m not really kidding. The only skill I have is endless patience and this fight tested my ability to persevere beyond anything I had experienced in a video game. I’d come to terms with that reality and accepted it because this would very likely be the final Dark Souls boss I would ever fight. well, at least until the reboot the franchise in 10 years and I have to do this all over again. Or I decide to foolishly pick up the re-mastered Dark Souls 1. Remember that I went into here with the Bandit Blood Knife build, and that he can bleed. It takes me about five attacks to trigger blood loss, but when I do, its really satisfying. If I can time it impeccably, I can even attack 4 times, fade back to restore stamina, and then move in, trigger bleed on my first strike, attack a few more times and stagger him. At that point, I often have enough stamina for a second bleed trigger, which can really drop his HP fast. It doesn’t always happen, but sometimes it would. When you enter the arena, its a slightly rolling ash field, sloping down from the front and left to the right edge. 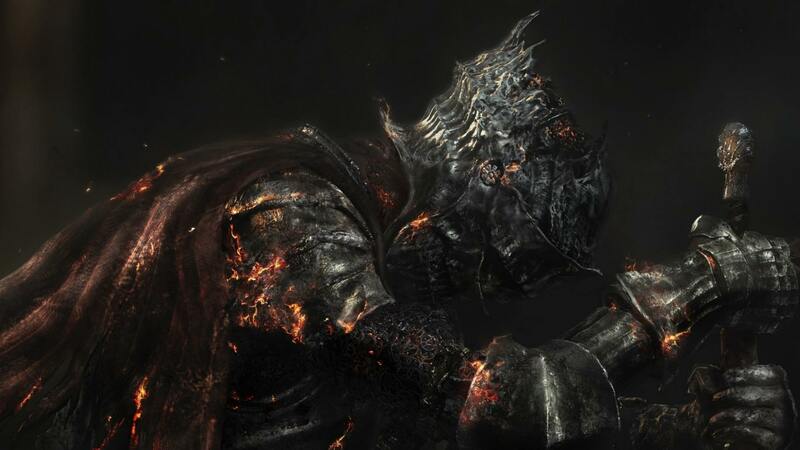 In the center is the Lord of Cinder, the final boss of this intense calamity, and the last obstacle to overcome prior to completing the game. What is so clever about this is that they put the boss of the series on the cover art of the box, and I never expected it. I assumed it was a possible armor set and weapon I could find somewhere, but never in a thousand years did I expect that the model I saw on the front of the game would be the last enemy in the game. My mind was sufficiently blown. He pulls out his sword – a coiled sword from the bonfires – and engages you, quickly and powerfully slashing with his single sword. This is his first phase. He has a fairly long straight sword, and rapidly attacks in 270+ degree arcs while turning to target you nearly the entire time. While blocking, his blows that connect did a little under 1/2 my stamina bar, often meaning that if I had put any sort of work into fighting or defending prior to both of them connecting, he would stagger me and get another attack in. He has a single, advancing slash that is his most basic move, taking up a huge amount of the screen, lunging forward and tearing a huge swath in front of him with his sword. When this one came, I would roll back, not wanting any part of it. He has a powerful overhead strike, where he takes the sword and brings it almost 180 degrees from the ground behind him, up over his head and smashing into the earth. Thankfully, because it does massive damage, that one is easily straffed or dodged left/right out of the way. If I could time it right, I could get a slash or two with the Blood Knife and start to build up bleed. He has two separate double slash move sets that are hell on timing. both of them can be blocked and then rolled, but if you miss time which set of double slashes it is, you get wailed on. You can also double roll, but the timing has to be just right. These I had to learn how to roll for specifically, and once I got the timing down for these attacks, it was simply dodge them and wait for the next opening. He also has a triple slash move set that is exactly like the first double slash, but adds in a slashing up-swing. If you assume this is a double-slash, it will cause significant damage. He also has a pair of high sword swings. In both instances he raises the sword high, about chest level and parallel to the ground and also raises his leg up, knee bent. In one move he quickly slash-thrusts downward, and in the other he spins, trying to get a lock, and then brings the sword crashing down. Knowing which one is nearly impossible, and both track you for a while. The downward slash is hard to avoid, but the spinning knee was my favorite time to attack. After he’d completed around one rotation, he would slam the sword down and take a few seconds to recover. Because of the amount of stamina I had and the speed of the bandit knife, if I started attacking before he came down with the sword into his back, I could get the full five hits and bleed off, taking a huge chunk of his life away. He will, from time to time, jump backwards to get distance between the two of you so that he can better slash you. Press your advantage. and don’t let him up. Normally, once you get him down about 20% of his health, he will change forms. Most often he takes an Intelligence based form, but I have seen him take any of the others, as well. Wish I had good pics, but only screenshots. In this Intelligence based form, he has a number of irritating, attacks, though all but one aren’t truly dangerous. His first action is often to surround himself with homing soul orbs that surround him like an aura and launch themselves at you when you get to close. This is the most dangerous of the abilities because many attacks require precise timing to defend against, and this one can really fool with that timing if the damage comes in at the wrong time. The other actions are a slightly homing singular and powerful bolt, a non-homing spray of bolts, a strongly homing and maintained beam of energy, and finally a magical sword slash. Thankfully, the answer to all of these is rolling. The singular bolt you can dodge at the last moment, as it will not have time to home. The spray of bolts you’ll need to roll early because it doesn’t home, but he will turn to face you. The maintained beam you need to roll either 3 or 4 times to get out of the way, all in the same direction, and the sword you just need to roll under. The sword is probably the hardest part because its hard to tell, due to how he moves, whether he is doing soul masses, soul spear, soul rain, or sword. If you are close in and have managed to get to his flank or rear, you can keep attacking if its any of the other attacks. If its the sword and you don’t dodge, he flings you up into the air and breaks your rhythm, which is exasperating. In each of these instances, I would press extremely close into him. His sword strikes were powerful, but if I rolled just a hair after he raised his staff to cast a spell, I would most often avoid even the sword. I would keep strafing around him and stabbing his back while also trying to avoid the masses, which is a pain. After this form starts, it becomes random when he shifts into and out of each form, so keep your eye out. It was obvious both when and what he shifts into, so I adjusted my plans accordingly. In he next form, most often for me,he extends his sword into a massive, coiled spear. This move set is both extremely dangerous and one of his most vulnerable times. If you know the moves and can see the clear telegraphs, you can often get repeated strikes in. If you fail, though, and don’t notice what is going on, he can also kill you very, very quickly. He has a single, powerful baseball-spear swing that takes out a huge swath in front as well as most of the area behind him. Hard to dodge but easy to block, with a long recovery time. Keeping to his knees will often net me two attacks with the knife. This is his most common attack. He has a double tornado attack that can hit twice nearly every area close to him. He does charge it up for a brief second before letting loose, telegraphing it well. Rolling through this, and often behind him, is both dangerous and necessary. Often, you’ll roll through the first one, but have the wrong timing to get through the second one and eat it to the face. Get the timing right, though, and you can stick tight to him and get an attack or two in while he recovers. He has two direct thrust attacks, the most dangerous of which is his charged up and run to impale you. This has pretty solid tracking too, enough that if you dodge to early, you’ll get speared as you stand up. This attack also you backward and hits you repeatedly for massive damage if it connects. Roll to the side and forward – towards him – a full moment before he hits you and he’ll run on by and you can run up and get a few blows in as he is recovering. The second thrust attack is simply two quick thrusts, often followed up by the double whirlwind. Blocking both of these attacks will nearly inevitably leave you stunned and eating the double tornado on the jaw, which will likely end your attempt right then and there. Roll out and away from him to avoid needing to dodge the double tornado as well. Here, he also has two miracles, both of which can be amazingly irritating. The first is a blast of holy energy that he charges up for about a half second before releasing and knocking you out of guard as well as dealing damage. This attack is amazingly easy to dodge, but I am so dumb I almost always ate it. Because most of his attacks in his form are slow to build but come in rapid succession, you often get just enough time to attack between every move. Doing this with the holy blast is punishing. I was greedy in this phase. The second is the one that makes me deflated every time he does it and I am out of stamina, which is the heal. He both heals immediately a moderate amount but also heals over time, though the spell itself has a long cast time. If I have a bar of stamina, I can almost always get a full bleed trigger which offsets the heal. If I do not, he often heals an entire bleed trigger, some five attacks or so, between the instant heal and the HOT. It makes me very sad. The last of his four forms is that of the Dexterity based leaping PvP fool. He has a curved sword that he rapidly strikes with in a pattern I never could really get a hold of but were easy to block because they deal minimal damage, and casts a number of pyromancy spells, including Fire Within, Fire Ball, Fire Blast, and Poison mist. He also flips everywhere, which is amazing. Poison mist almost always gives you a chance to heal, which is great, but also is extremely poisonous. Standing in it isn’t a strong option. Fireball is easily dodged, as is fireblast. Fireball is him simply throwing a ball of fire in your general direction. Fire blast is much more irritating, as he only casts it towards his left shoulder and has significant tracking, enough that if you simply strafe, you’ll get his by it, which is irritating because strafing out of the way of fireball is easy and allows attacks. getting these two mixed up results in singed flesh and burnt eyebrows. Lastly, is Fire Within, which is exactly as miserable as you’d expect, except that he takes no damage from it. His attacks being more powerful in this form isn’t all that irritating. Because this form is so swift but also able to be blocked, I would generally wait it out until it settled on another form, hopefully the spear. At that point I’d close in again and work inside the spears reach to stab him repeatedly with the knife and bleed him out. This shifting and changing of forms lasts until you’ve depleted his life bar. Sometimes he can go on a very easy stretch, skipping one or more of the phases and returning to the first, and sometimes he can go right into flippy-ninja phase and cause irritation from the onset. There are two extremely dangerous portions of the game, more than others, that I hate seeing. the first is switching from Sorcery to Spear, and maintaining the Homing Soul Masses above his head. As this spell lasts for a given duration, it will keep generating masses until the spell runs out. This is massively irritating when fighting the spear because it requires pinpoint dodging while also near his person, which triggers the masses to strike, which throws off the dodge, which gets you killed. 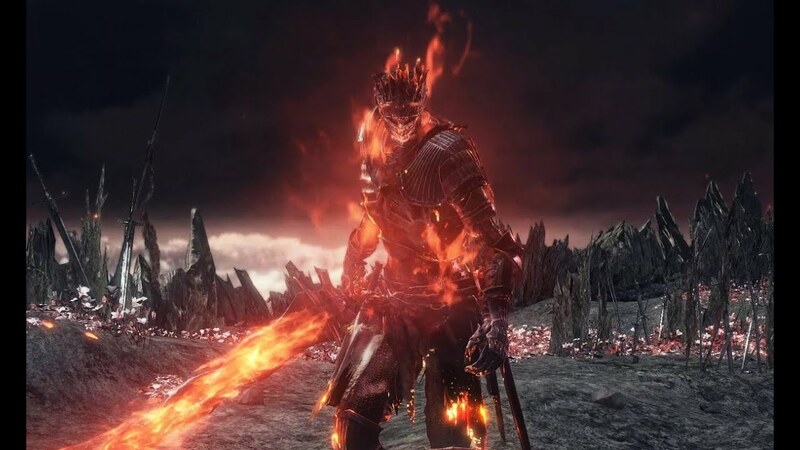 The second part is when he uses the Fire Within and then shifts to his first, long sword form, because he then does extremely significant fire damage as well as rapid, already powerful strikes. I never found a way to cut through that. Anytime either of these happened, I would often simply out wait the spell and then dive back in once it expired. He will also do three leaping attacks, a far, a mid, and a close range. The close range is a simple dodge, the mid range is a thrusting attack, and the long range is a huge leaping downward slash. I avoided all of these like the plague. He has a thrusting attack, which is easy to double roll away from, as well as a double slash that can also be double rolled out of. He also has two ranged attacks, where he summons lightning, then heaves it to smite you. The first way is a direct bolt, roll left/right to get away from it at the last moment. It explodes in a burst and has mediocre tracking, so take your time and don’t rush it. The second he tosses the lightning bolt into the air and makes it rain lightning in your entire general area. Roll twice, three times if you rolled early, to avoid the whole thing. Additionally, he can grab and stab you, which does an awful lot of damage, but doesn’t kill you all the time. What it will do, though, is break your target lock, cause you to hesitate to try and find him and THAT will undoubtedly kill you with what little health you have remaining. Avoided that like the plague too. Finally, he can kick you in the chest like a mad spartan, which will both stun you and break your block. He often follows this up with a grab, which means that you’re going to die on the stab portion – Its no fun for anyone. Avoid like the plague. This second portion of the fight I played in the absolute lamest way possible. I switched weapons to my secondary, the Black Blade, and then stayed, while locked on, as far out from him as I could. I’d double roll anytime he got close and attacked and then would back away again. The only time I would attack would be following his super-jump. When he would leap towards me, I would roll into it and a little to the right, and then turn around and wack him in the heel as he recovered. One strike, and not a touch more. I would then back away again and bait him into leaping at me so I could, once again, strike his Achillies heel. When I finally beat him, I was clearly in the zone. I made it through the first health bar without using a single estus flask and without taking any damage. I don’t know how it happened, but I was very pleased. The Second phase went just as smoothly, though I did eat a number of hits, I healed every time he stopped for the 5 hit combo to be safe, and never really felt threatened. Speaking of Healing, I could never really get the cadence down to when I could heal without being smashed in the face with a blade, spell, or spear, so I often wouldn’t heal unless he was extremely far away. This goes doubly for the second phase of the fight, where I only felt confident healing when he was busy for so long he couldn’t interupt me. This made making mistakes doubly painful, because each additional mistake was compounding due to me not being good enough to heal. It took forever, but I eventually did it. Patience and determination won through the day as I finally, at long last, destroyed the final boss of the main game to earn my much deserved reward.